One hundred and seventy years ago yesterday should have been a joyous day for my Nuckel third great grandparents. 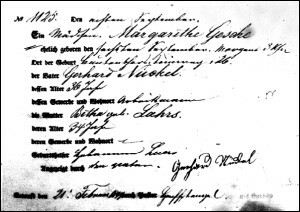 That same birth registration form was where, sometime later, it was duly recorded that Margarethe was baptized on the 21st of February 1844. The pastor’s name is unfamiliar;3 her siblings had all been baptized by Pastor Iken, pastor at the Bremen Neustadt Church of St. Paul’s. You have to believe they thought they would beat the odds with this little girl, too. That losing her was a sucker punch right in the heart. And you have to wonder… you always have to wonder… What was she like, this little girl who played so very briefly in the branches of my family tree? Was she merry and bright? An active handful until some final illness stole her strength away? Was she blonde or brown-haired? Blue-eyed or brown? Was she doted on by her older brothers and sisters? Did she have a streak of mischief, this toddler in that busy household? Was she plump or skinny? What toys did she have, perhaps passed down from her older siblings, handmade by her mother or father? Was she an early walker, or still wanting to crawl more than walk? What words was she saying? Was she saying “mama” and “dada” — or whatever was the equivalent for a German baby of that time? How incredibly worrisome to have children knowing such terrible odds of them living! The records you have found are so detailed… but no details of who she was as a little person. My youngest granddaughter is 16 mos old just now, and I can see her chasing after her older siblings, playing peekaboo, crashing towers of blocks, giggling… Imagine. It’s so hard to look at these records, Celia, and not be grateful down to our toenails when we look at our own children, grandchildren, nieces and nephews at that age and know that ours most likely will live when those earlier children were at such risk. I also feel the need to remember those whose lives ended too soon after their lives began. 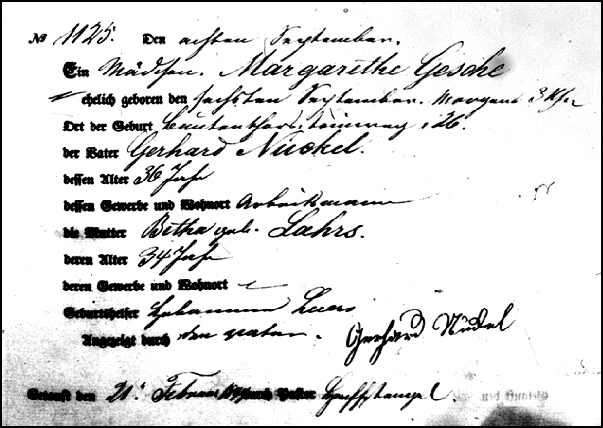 The story of German infant mortality that breaks my heart is that of Gottfried Gugeler and Christiana Klein of Wangen. They must have wanted to name a daughter Christina Heinrika Gugeler. They had five baby girls with that name, but only the fifth lived long enough to marry and have a family. All the other died before their first birthday. That’s just heartbreaking, Emily. I have a similar, but not quite as persistent, story in this same Nuckel family a couple of generations later. My own great grandparents gave up trying to name a child Carsten Hinrich after the second little boy with that name didn’t make it. What a lovely post, I often wonder about the children who died young in my family tree. It is good to acknowledge them. There are a very few writers where I frequently have to stop and read a particular sentence over several times to savor it, because it is so beautifully written. Judy Russell is among those few. Awwww… thanks so much, Cathi. What a thoughtful post! Thanks for sharing. One of the most poignant stories of a child gone too soon that I’ve uncovered in my research is of the infant daughter of an immigrant family. It was said that the father stained her tiny coffin with the juice of wild raspberries, and her mother lined it with material from her best dress. The parents then planted a tree to mark the grave, but were crushed further to find the tree trampled by cattle. The father eventually fenced the area and it became what is now Elm Grove Cemetery near Tabor, South Dakota. Awwww… what a heartbreaking — but great — story, Melanie.